The Beat frontman Dave Wakeling. Ska fans who enjoyed the BBC Biggest Weekend get a second helping of The Beat next week. 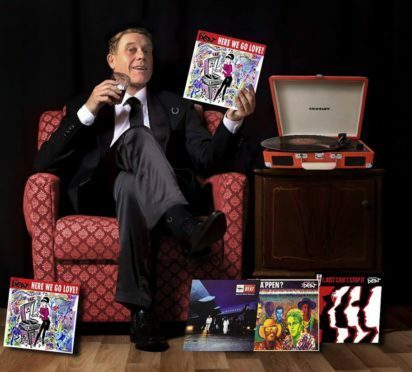 Barely a fortnight on from their Scone Palace turn the Dave Wakeling-led seven-piece will be appearing at PJ Molloys in Dunfermline on Tuesday, June 12. The Two Tone legends have just released their first new album since 1982 despite touring regularly in America over recent years. California-based Dave told RockTalk they’ve enjoyed a hectic year few months, with no let up in sight. “Up until this tour we’ve been in America playing clubs in major cities and building up to the album,” he explained. “I do 160 shows a year and we’re booked up solid until the end of the year. It’s the band’s 40th anniversary in 2019 and we’re trying to arrange some more in Britain around a television-advertised celebration record that’s coming out in March. Dave, 62, said new album Here We Go Love! — which has attracted glowing reviews — was four years in the making. “If it’d got panned I don’t know what I would’ve done — I didn’t sleep for a month before it came out,” he admitted. “It’s put us back on the map, but the really exciting thing for me is people say it deserves to be called a Beat record. I wanted to make sure I spent the time, the energy and the passion to come out with something that if it was going to use the name it was going to be worth it. “One review said it’s the most focused Beat album ever, which I’m happy to take. It took a lot of time, tears, excitement and joy and I wouldn’t accept it until it was just so. “I wanted it to sound smooth and easy all the way and it does. The things that people used to love about us — the passion, the politics and the freshness — are still there, and we’ve all grown a little. “It’s the same stories I was singing about in 1979 with the same excuses. Some of it’s stuff we didn’t deal with that’s come back to haunt us. “We made 13 songs as a baker’s dozen thinking one cake would drop on the floor perhaps and get spoiled, but they all came out lovely because we took great care over them. The songsmith said he’d revelled in his return to the studio. “We got to use all these gorgeous classic instruments and amps,” he added. “We recorded the drums onto analogue tape to give them more of a retro feel, and I played a lot on a 1959 Telecaster worth 30 grand that sounded like a bell, absolutely beautiful. Not to be confused with ex-bandmate Ranking Roger’s separate Beat line-up, Dave’s band — aka English Beat — impressed at Scone with such classics as Mirror In The Bathroom, Ranking Full Stop and Can’t Get Used To Losing You, plus comeback single How Can You Stand There? More of the same’s in store on Tuesday, but the father-of-two reckons he’s on a hiding to nothing. “You know you can’t get ’em all right,” said Dave. “I can do a two-hour set and come off stage and people’ll go, ‘Well what about Best Friend, or Ackee 1-2-3?’ There’s always going to be some missing. “If you do too many new songs people can feel a little offended that you’re trying to plug your new wares at the expense of all those other records they’ve supported you in the past by buying. *** Dundee outfit The Mess Arounds head up a soul show at Clarks on Lindsay Street on Sunday, June 10. The early gig includes a DJ set from Kit Clark, with tickets £6 via Eventbrite. *** Dunfermline indie rockers Underneath The Lights headline on home turf at PJ Molloys tonight. Tickets to see the four-piece — who’ve just released their new Wasted Time EP — are £6 from Ticketweb. *** Dock Street pub Number 57 has rock covers veterans Tivvy tomorrow, Saturday, June 9, from 5.30pm, with R&B combo Junkyard Dogs on Sunday at 7pm. *** Whitehall Crescent venue McDaniels has tribute outfit Cherry Bombz unplugged tonight at 9pm. They’re also playing Arbroath tomorrow and Carnoustie on Sunday.